The application of make-up for women was made more convenient in the 1920s with the popularization of small container known as a "compact". Inside, pressed (compacted) face powder was housed with a cloth of feather "puff" applicator and a mirror for checking the job. 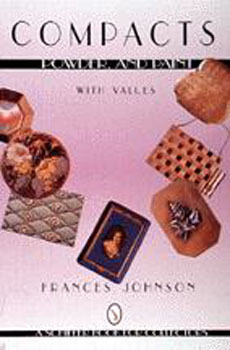 In this book, Frances Johnson has compiled hundreds of different compacts of various materials, styles, and values along with delightful stories about girls who did or did not paint themselves up to attract boys. Her direct style is tinged with humor, making the compacts here all the more enjoyable. Prices with captions.